I used Peerless Watercolors for the background- painted them on Watercolor Paper. 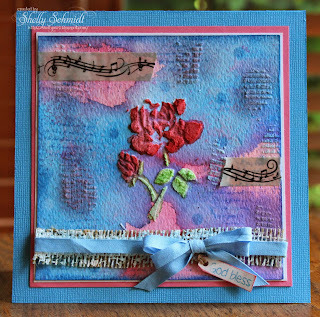 I used Geranium Pink, Royal Crimson and Sky Blue.. One it dried, I stamped a portion of the script in Nassau Blue on the background-here and there. I used the Rose flower from the stencil and added embossing paste, then added some texture paste around the flower thru drywall tape. I added some dots with White Dye ink and Nassau Blue. I daubered ink over the embossing paste with Pink and Blue inks. The rose was painted with Peerless watercolors. I hope you enjoyed my Pink and Blue card- we'd love to have you come join us in the challenge.